← The Big Gabriel Cushing Giveaway! Free entry prize draw. With the universe of Gabriel Cushing expanding so rapidly, we’ve had to give gabrielcushing.com a real overhaul. As of today, the dedicated site now incorporates all the current and upcoming titles, plus a news feed and more. To celebrate, and to help us get the word out we’re running an epic giveaway of Gabriel Cushing merchandise! Just click here to enter. The intrepid demon hunter made his debut appearance in our short film Terror of the Killer Carnivorous Coat in October 2011. When we shot the film back in 2009, we had no idea how many more stories Gabriel would have to tell. A year later he returned to battle vicious Zombie Vampires in the sleepy town of Little Easton. There he met his new partner in supernatural crime fighting, Melanie Lancley. Gabriel fends off the Killer Coat, Ka with the scissorfix. 2013 will be a big year for Gabriel and Melanie, starting with their first comic book appearance in Fright at the Opera. Then, this winter, the duo returns to the screen in a new web series featuring multiple short stories. Also later this year, watch out for Gabriel’s first appearance in a novel; Mime. While all this is going on, we’ll be hard at work producing Gabriel’s next big adventure, Carnival of Sorrows. This third web series will be the most ambitious yet, and you can get involved along the way. Starting in May, we’ll be running a Kickstarter campaign to raise funds for the shoot and we’ll be offering some great rewards for our backers, including digital downloads, DVDs and merchandise, some unique items from the shoot, and opportunities to be involved with the shoot itself. Make sure you follow, like or subscribe to keep up to date, do it now and you’ll also earn an entry in the giveaway. 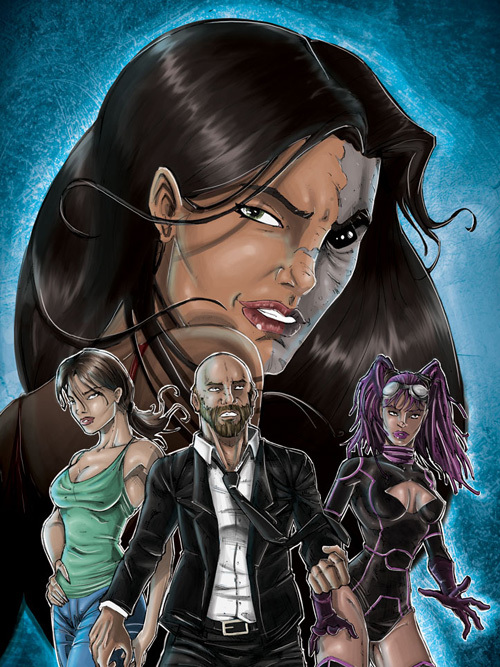 Gabriel Cushing stars in his first graphic novel adventure! The occult academic is called in to investigate the supernatural events occurring at the Palace Theatre as it prepares for an all new show. Soon he uncovers the murderous intentions of a Banshee, whose rage is directed at the cast, crew and audience. Co-published with Hellbound Media, the new story by Mark Adams is illustrated by Amrit Birdi and lettered by Nikki Foxrobot. You can read a preview here on The Great Escape right now, and the full comic will go on sale from the 11th May at Bristol Comic Expo, as well as by mail order from The Great Escape or Hellbound Media websites. Horrific demons! Sadistic ghosts! Suspicious stews! Cursed furnishings! Gabriel Cushing and Melanie Lancley return in a series of short horror adventures. The monster hunting pair continue their investigations into the eerie and the unnatural, encountering all manner of new threats. “Strange Encounters” features actions, horror, humour, blood, violence, twists, turns and terrifying, other-worldly villains! 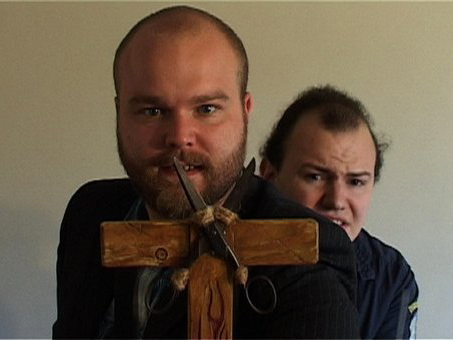 The second web series for Gabriel Cushing features separate stories by writers Mark Adams and Matt Warner, and sees Gabriel battling new and mysterious forces. Shot over several short shoots this year, the series follows Gabriel as he pursues his quest to fight evil and protect people. Meanwhile Melanie learns a lot about the supernatural under Gabriel’s tutelage. 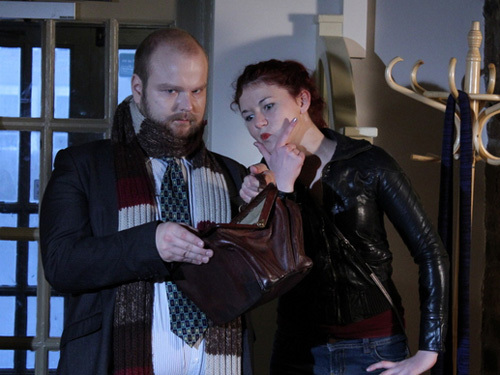 Gabriel (David Curtis) and Melanie (Sam Herbert) on the set of Strange Encounters. Check out Gabriel’s new bag. Gabriel and Melanie unearth an age old curse, trapped souls and mysterious deaths, but as they dig deeper they find themselves the target for a collective of powerful new foes; a troop of damned carnival performers bent on returning to the land of the living. If you’ve been following the adventures of Gabriel Cushing so far, join in the production of series three by supporting our Kickstarter Campaign in May and June. We want to make this the biggest and most exciting adventure to date and you can help make it happen! Follow or like us to get regular updates on the production. Plus, we’ll bring you a bigger update with more details in May, so stay tuned. Journalist and paranormal investigator Elliot is on a mission against evil after his brother’s death at the hands of an unknown supernatural force. He seeks out both true stories and hoaxes and reports them in Weird News. When he starts investigating a series of bizarre and seemingly unrelated deaths, he draws the attention of something altogether more dangerous than his normal ghosts and fortune tellers. Out of his depth and on the run, Elliot searches for the only person who can help; Gabriel Cushing. Together they follow the leads left by generations of demon hunters before them to discover a way to defeat the deadly Mime. Written by Chrissey Harrison, and set between the events of Terror of the Killer Carnivorous Coat and Gabriel Cushing vs the Zombie Vampires, Mime fills in a gap in Gabriel’s past and introduces a new hero of the Cushing universe; Elliot Cross. After vanquishing his nemesis, Ka, the killer coat, Gabriel feels his duty is done, but fighting alongside Elliot opens his eyes to a wide world of evils to be fought, and if he doesn’t take up the fight, who will?